John Piper has become increasingly well-known for his biographies of men (and possibly women?) who have been greatly used by God in building his kingdom. A few months ago I read this great essay by Piper on J. Gresham Machen’s life and contribution to the church. As I was recommending it to a friend the other day, I thought I would follow through with a long held intention to post it here. The essay, which is a transcript of a 1993 talk by Piper at the Bethlehem Pastors’ Conference (where it seems he often gives these biographical talks), serves as a great introduction to modernism and liberal theology, and a background to the battles that are still being fought in the Presbyterian church in the USA. 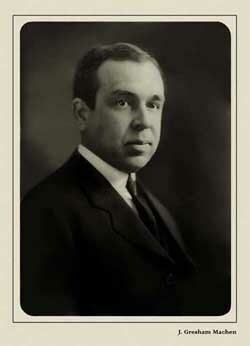 These issues are seen through the prism of Machen’s life, in his opposition to liberal theology, and his founding of Westminster Theological Seminary and a new Presbyterian denomination. Piper also draws out several lessons for Christians from Machen’s achievements and possible weakness, all written in a very engaging style. Well worth a read or a listen!